1.Dolby sound(AC3 audio format) is not supported. If it display picture without sound, please turn off Dolby Digital in Apple TV, Blu-Ray players and Fire stick etc. 2.Please aim to the IR window when using the remote control. 3.Please use the projector in dim or dark environment for best effect. 4.NOT recommended for PPT, word, excel or business presentation. 5.Lightning digital AV adapter is needed when connect with iPhone; MHL cable is needed when connect with Android phone, please note that the Android phone must support MHL function before connection. 6.To avoid overheating and extend its working life, we suggest that you have break after 3-4 hours using. 【Brand new model, +30% lumens brightness】Brand new model with upgraded new technology of LED light source, optical path design and the latest multi-piece combination coating lens. This projector also has the updated turbofan cooling system and High efficiency copper alloy heat sink, only cause noise under 20 dB when working. 【Best video entertainment】 2000 lumens, 3000:1 contrast ratio, and it even support 1080P videos display. 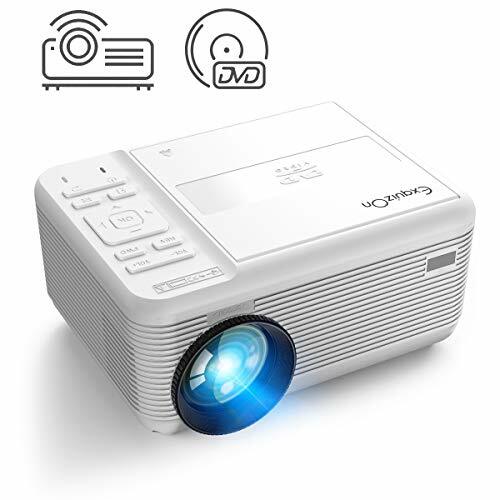 This projector can provide excellent watching experience in any dark environment! 【Portable size and big screen】12.3*8.0*4.6 inches and 2.3 lb, you can even hold it anywhere you go. 【Upgraded cooling system】Because of its upgraded led radiator, this model has higher cooling rate but create only half of the noise that other projectors make (around 30 db).